THE local campaign period has yet to officially begin but mayoralty candidate Vilma Caluag said that she feels as if she has already won the race. "The way many Fernandinos have welcomed my candidacy and the support I'm getting now make feel as if I've already won the mayoralty race in the City of San Fernando," Caluag said before members of the Capampangan in Media, Inc. (CAMI) last Friday, February 8, at the Bale-Balita. Caluag confirmed that former congressmen and former mayors Rey B. Aquino and Oscar S. Rodriguez are both campaigning for her. She said she has combined the political slogans of the two former officials and former political rivals to form her own. "It's Magsilbi Tamu and Luguran Taya ing San Fernando,” Caluag, currently the president of the Association of Barangay Captains in the city, declared. 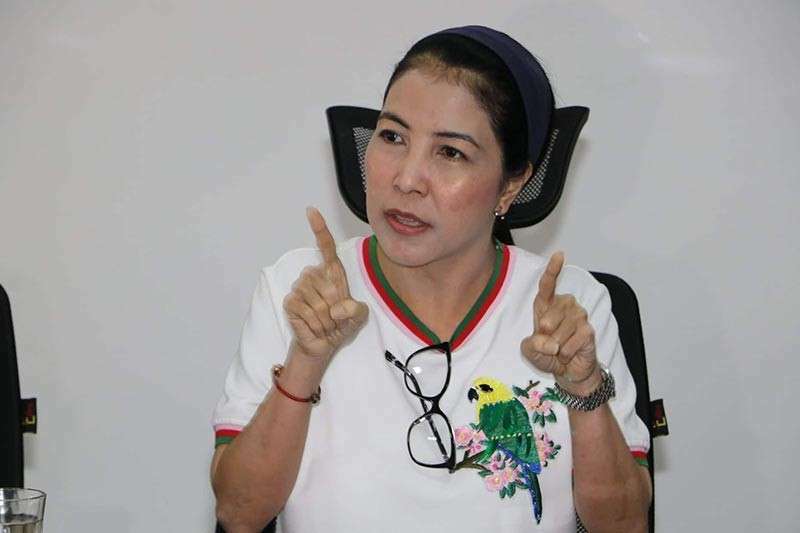 Caluag said that she has decided to run for mayor of the city out of a "call for necessity", stressing the many unmet needs of the people of San Fernando, particularly on health and educational services. "There are many sick Fernandinos and the city government doesn't even have its own dialysis center", she said. She bewailed what she described as the inconsistency of the city government in implementing programs for the people, blaming the current leadership for the discontinuance of programs initiated by Aquino and Rodriguez. The lady candidate wants Mayor Edwin Santiago to explain how the city budget, which she said amounted to P1.7 billion last year, was spent. Caluag noted delays in extending social services to the public, even hinting at possible irregularities in giving financial assistance to the needy. "There are reports that those who are seeking financial assistance are made to sign a blank paper," she said. She took shot at the distribution of real property taxes among barangays in the city, particularly Dolores, her turf, which she said is questionable. She said she had brought the matter to the attention of concerned agencies, even business leaders, but to no avail. Barangay Dolores is currently getting P3 million a year as RPT share but Caluag thinks it should be more. "I will find out what's the correct amount when I become mayor,” she said. Caluag said that, at first, she approached Vice Mayor Jimmy Lazatin and Councilor Angie Hizon to run against Santiago but declined. "How can you fight against the P1.7 billion coffer of the city," she quoted the two officials as saying. Caluag also scored the current city administration for its poor infrastructure program which, she said, is allotted about P300 million a year. "With P900 million, all roads in San Fernando should have been paved," she said.